QMobile has taken yet another step to establish itself as the prime smartphone company in Pakistani market. This time around, they have announced their first ever Windows Phone, which is also one of the cheapest ever. The company has reacted well with this move, in the wake of the mounting sales of the Lumia series. The W1 costs just 6,999 PKR. You’ll have trouble finding a new Microsoft smartphone at that price level. For that you get a 4″ display with WVGA (800 x 480) resolution running on WIndows Phone 8.1. We don’t know whether the OS will be upgraded to version 10, though, which is a problem because the entire Lumia range will likely be. Furthermore, you get a 1.2 Ghz quad-core Qualcomm Snapdragon 200 processor with 512 MB RAM. That means you won’t be able to run a few notable applications but at this price, that is to be expected. The back boasts a 5 megapixel camera, along with a VGA camera at the front. We can’t say for sure whether the phone will get enough breathing space in the tough situation it finds itself in. 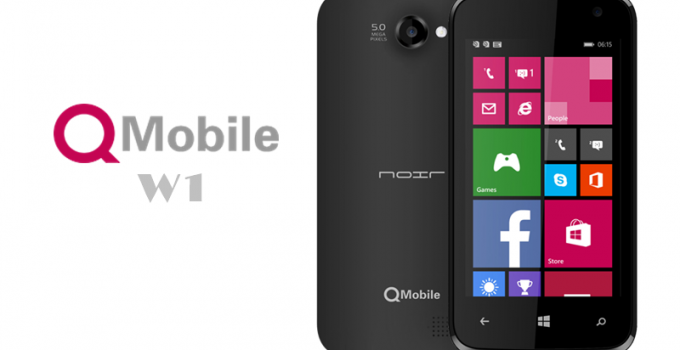 Hopefully it is not the end of the line for Windows Phones from QMobile. We would still suggest that you save some money and get a Windows smartphone with 1 GB RAM, but if your budget is tight, this phone hopefully won’t disappoint you either, especially at that price tag.